FEATURES: Waterfalls, alpine views, bird life, old-growth sub-alpine forest & alpine meadows. 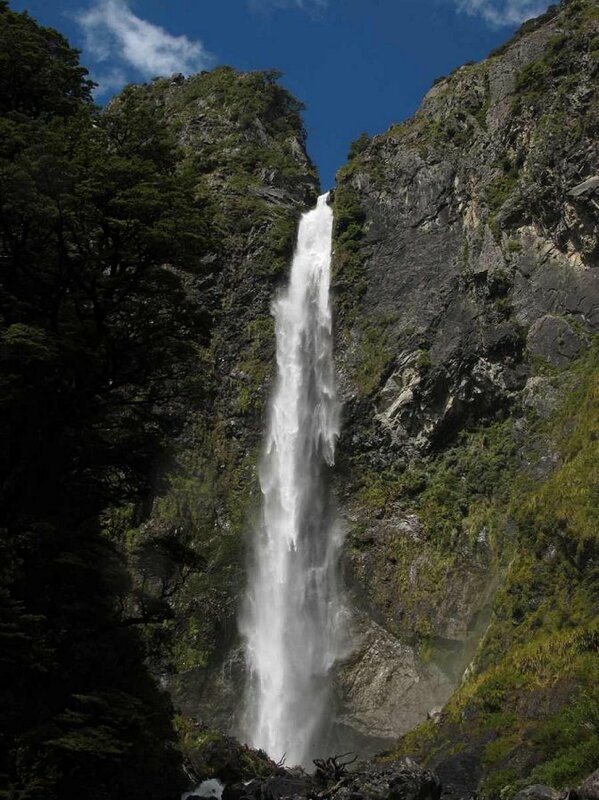 BRIEF: This walking route joins together the following walks - Arthur's Pass Walking Track (including Bridal Veil section), Bealey Valley Track, Dobson Nature Walk, Temple Basin track and the Punchbowl Falls walk. It will take you through a wide variety of landscapes, and give you the best overview of the area. LOCATION: Turn onto Punchbowl Road, 500m towards the West Coast from the Visitor Centre (end of Village). At the end of this short road is a carpark, and a signpost here points the way to the Arthur's Pass Walking Track and the Punchbowl Falls walk. This is about a 10 minute walk from the Visitor Centre. DESCRIPTION: It is best to follow the Arthur's Pass Waliking Track firstly; this will take you through stunning sub-alpine forest, via many water features, a lookout, the Bridal Veil canyon, and onto Jack's hut (a historic roadman's cottage on the highway). 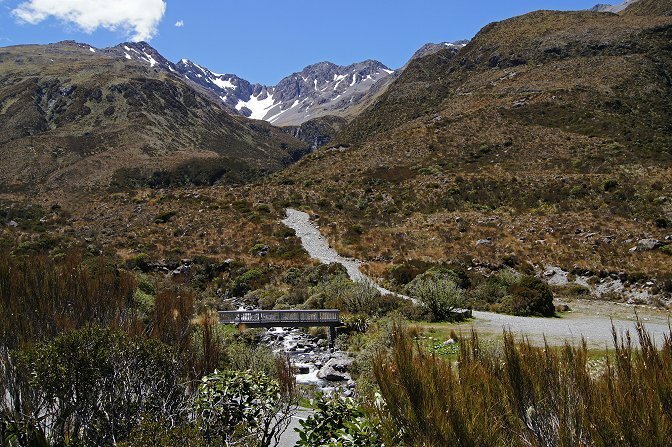 Cross the highway at the hut to find the continuation of the Arthur's Pass Walking Track. After 200m turn left down a flight of stairs onto the Bealey Valley track. Follow this track for about 15-20 minutes across the Chasm bridge, climbing the steep, rocky hill on the other side to open into a snow-grass clearing with superb views of Mt Rolleston (2275m) and the Southern Alps. You may if you wish continue up valley for a further 15-20 minutes to the end of the track at the avalanche danger sign. 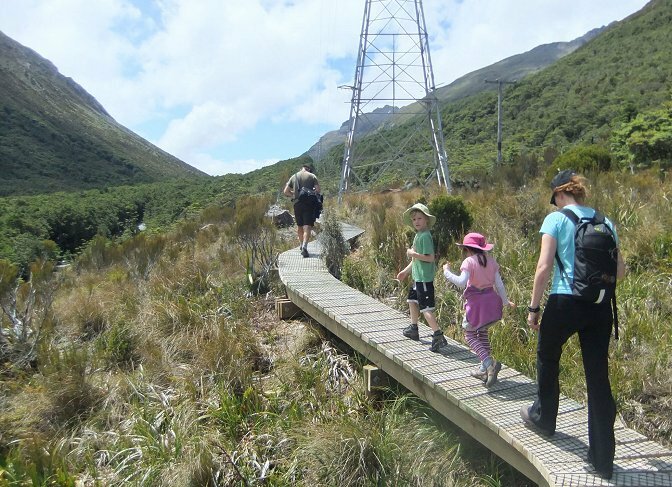 Retrace your steps back across the Chasm bridge to the Arthur's Pass Walking track junction. Follow the track track for about 20 minutes through old-growth beech forest up onto to the scenic alpine meadows of the Dobson Nature walk. IF YOU ARE CATCHING THE TRAIN OR BUS AT 3PM/4PM YOU MAY NEED TO TURN-AROUND NOW, OR AT LEAST WATCH YOUR WATCH (Don't miss them)! 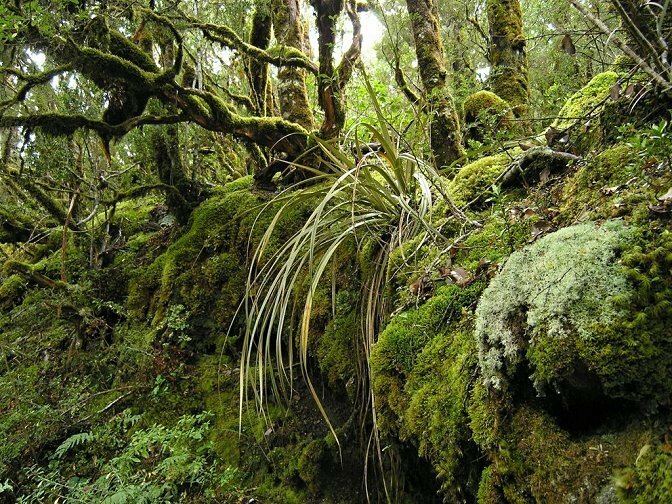 If you have time and want an easy walk, turn left onto the Dobson Nature walk and follow it for 20 minutes up onto the real Arthur's Pass (920m) through diverse alpine vegetation (wild flowers from late November until early February). Alternatively, if you have time, good weather, and good solid walking boots, turn right, and carefully cross Highway 73 to join the Temple Basin Track. This track rises steeply on a loose & rocky track towards the "walk-in" skifield. You only need to walk for 15 minutes to get the powerlines out of sight for a spectacular view of Mt Rolleston and the Bealey Valley. To reach the skifield you would need to commit to a further 2-3 hours return of walking on this track. Return to Arthur's Pass Village on the identical track system you have used, then finally call in to the Devil's Punchbowl Walk, this takes you to the base of the 131 metre Devil's Punchbowl Waterfall (40-60 minutes return).